You’re probably getting bombarded with an overwhelming amount of sales right? I know, it’s almost too much to handle. So many sales, so little time. I promise to keep it simple make it as easy as possible for you to shop only the best items. Here is a quick roundup of the BEST sales before Black Friday arrives. Most retailers are starting their sales early so start your shopping before all the good stuff sells out! I’ll be updating this post every few hours through Thanksgiving and there will be a brand new post on Black Friday with a complete list with ALL my sale picks. I’m also giving away $1000 as my way of saying thank you. I die over this dress. Looks like two pieces but in fact it’s all one dress! Fits perfectly with no alterations. Feminine and classy – so pretty for the holidays. The waist has some stretch and slightly loose on me but nothing a few pounds of sweet potatoes won’t fix. Ha! The bottom portion is very soft – not like a typical tulle skirt. It’s not poofy either – very tame and just plain gorgeous. Everything you see in this flatlay is current and available except for the bottom middle pair of jeans. Most are on sale! My sweater, jeans and boots are all on sale! Love this pine green poncho so much. It’s definitely oversized so I’d recommend sizing down if possible. I like the fit and makes it perfect to wear over leggings and jeans. It’s marked down plus an extra 40% off. You can layer it or wear it alone. I think it looks so cute with a striped shirt peeking out. Available in green and black. I have worn this striped sweater so many times, it’s almost embarrassing (lol). Currently on sale for under $40 and totally worth it. This plaid shirt is so soft and comfy! Sizing runs true to size and I’m wearing XSP. It’s a relaxed fit and can be worn as a tunic with leggings. Tons of other colors available. I’ve been loving JCPenney lately! Make sure to see my outfit HERE for under $100. I also recently got this burgundy dress and plan on wearing it with these OTK boots (petite friendly and on sale for only $30). You can even throw this plaid shirt over the dress and tie it at the waist – how cute would that be? 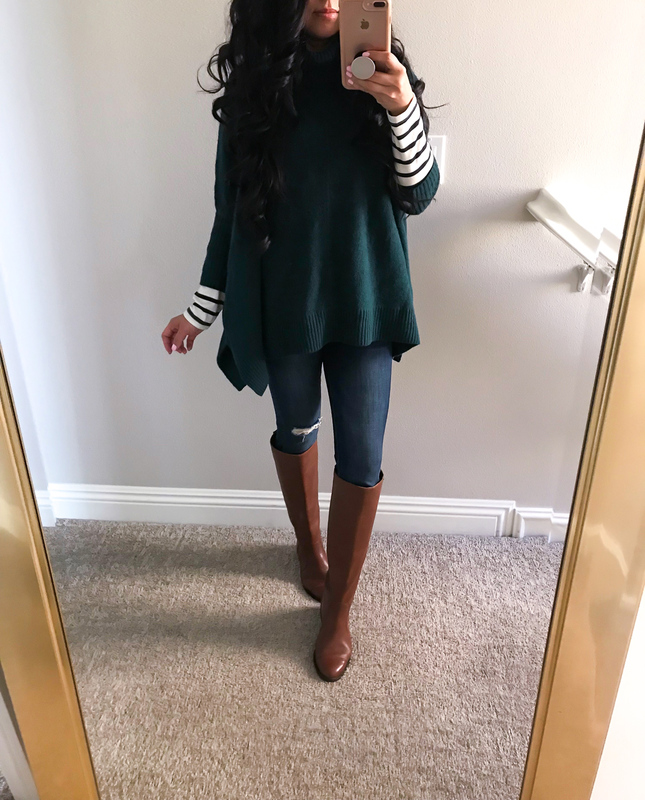 This outfit was from last year but now my ruffle poncho is available in petite sizes AND it’s on sale for only $14.99! I’m wearing S/M regular and it was oversized on me so I’d recommend getting the petite version if you are similar in size. Extremely comfortable and love the ruffle detail. My favorite poncho is now on sale for only $14.99! That’s 69% off! Insane. I’m wearing the color GULL MARL in size PS/PM. Get it. Cute and chic outfit ideas! TY! THE RIDING BOOTS! I would definitely purchase the riding boots. So many choices on how to wear them! I would love to get the plaid shirt and riding boots! Wow, such great deals! Karen Scott tan poncho. I love that you can dress it up or down and the price is amazing!! I love those boots! Soo classy and a timeless piece! I absolutely love that Ann Taylor button cuff sweater and Morning Lavender bow necklace! Thanks for keeping us updated on these great sales! Love love everything! I’d love to get the BP Runway boots and button sleeve sweater. Ahh I always love everything ! The boots and the twofer dress are my fav!! I like the green poncho from Loft! Just ordered to wear with a striped sweater underneath! Cute! Thanks for the idea. That green Loft poncho is so cute! I want one!!! If I won the giveaway, I’d spend it all on clothes…I need a new wardrobe! Love the Ann Taylor boots! OMG every outfit with those Ann Taylor boots is everything!!! I am going to buy that Maison Jules striped sweater. I love love it!!! Loving all your picks as usual but I’m partial to the Ann Taylor boots and the Morning Lavendar necklace. I love your picks just not sure I could pull it off. Thank you for sharing! I love all your outfits and getting style inspo from you. I have purchased many of the items you’ve posted about since I started following you a few years ago. Already bought the Maison Jules bow sweater 🙂 FYI I believe the code for jcrew outlet is “add2cart”. I definitely want the boots! It’s so hard to find the right height for riding boots for us petite gals! I love the boots! I would get the similar ones by ann taylor that you linked! Love the boots and poncho! Lauren Ralph Lauren. I also love the Coach Dreamer Leather Handbag. This is a great post! You are right, i am overwhelmed with all the Black Friday ads and promotions. Thank you for doing the homework for us! I am in need of boots and oversized sweaters! I love the plaid shirt!! Those Ann Taylor boots are adorable – and they need to be in my closet!! Love the ponchos too and that striped sweater and the plaid shirt – I’m so in shopping mode. I would buy Karen Scott envelope neck poncho, Ann Taylor cognac riding boots, and Loft poncho. Love all the recommendations. I’m especially loving your brown boots! I would definitely get the Ann Taylor boots and a poncho ! I love all your outfits. I really like all of the hat and sweater ideas as well as the riding boots. Perfect for a petite women like myself. Happy Thanksgiving. Honestly, I think the dress with tulle skirt and sweater piece is catching my eye. I’ve tried dresses like that on and I look ridiculous but being that we are similar in size and it looks like a perfect fit, I think this dress may work for me! Thanks SO much for this post, I love having so many recommendations (and links that actually work!). LOVE the riding boots. LOVE your style. I’m petite size 2 but I also need wide calf. Do you know of any riding boots with wide calf? RIding boots and last poncho pictured!! That Karen Scott poncho is super cute!!! I’d love to get a new poncho for my office it’s so cold in here. I LOVE the striped sweater with bow trim!! Close second is the boots! Love all the sale info on one page! Thanks! I’m always cold and was on the lookout for sweaters when I saw your post. I’ve already bought the crowl neck sweater in both petite and regular and a turtle neck sweater after reading your post. I’m hoping to get some ponchos and button sleeve sweater if I win. Love those riding boots ! Such a cute addition to any outfit! The pom pom hat, I love the pink one in your flat lay. Love your style! I’m buying your favorite poncho suggestion! I will definitely purchase a pair of riding boots! I have already purchased so much of your posts! I’ve never worn ponchos but love the Karen Scott One! I went to buy the twofer dress but it’s sold out. Thank you for showing us affordable options! I love buying fragrances at the holidays because you can always get a great deal on sets. This year I’m on the hunt for Bond No. 9 Wall Street for my husband & Le Labo Santal 33 for myself. I would buy the boots and cream turtleneck button sleeve sweater from Talbots! Oh and the poncho! Love your style! Love all the looks, I’d totally go for some cute boots! I truly love your sense of style. Being a petite woman, too many stores either think we are 12 years old and everything is too cutesy or 99 years old, with elastic waist pants and a cardinal appliqued on a sweater! You nail it every time. Thank you! I would looooooove to buy an LV bag! Or those boots you have! So cute! I am planning to buy boots! A girl can never have too many pairs, right?! I would buy a pair of Stuart Weitzman boots. Love the dress and poncho! Hi Annie, love all of your great Fall outfits, especially the ponchos and boots. Keep posting cute Milan videos!!! Love your riding boots! They look so comfy and classy. I absolutely loved all of these sale items and it would be such a treat to win your giveaway. I have been a long time follower and love your style as well as your home and your sweet little girl! I hope you and your family have a Happy Thanksgiving! Bless your heart! Love your style! Both you and Milan inspire me! Keep on doing what you do! Thank you for the awesome deal list and ideas!! Love the tips. Love all your styles! And great ideas!! Very helpful! I love all the winter outfits! I really want the Twofer dress and the plaid Loft poncho. Love the ann taylor boots and the ruffle poncho! I think I’m going to purchase the plaid shirt from J.C. Penney tomorrow. The riding boots are a close second! You make it too hard to pick one item. First would be the Madison Jules sweater then a poncho. I love that bow necklace! Plus I had no idea that dress wasn’t 2 pieces. Super adorable. I have been following you and Milan for awhile and love everything about your style and the way you dress your daughter! It’s style I spiration for me and my bow 10 month old daughter! Love the ann taylor boots you are rocking and the red buttoned sweater is a must for holiday time! Thanks for the opportunity, your blog has helped me on so many occasions when it comes to styling and pairing. How to use what you have and turn them into many looks! ❤️ your style and ❤️ Nordstrom! I am loving the poncho so that definitely would be in my shopping cart! I also need a new pair of uggs, booties and that under $40 Peacoat. BTW, loooove your style. You always so chic! Your hair is very shiny and pretty. What hair products do you use? I love all the sweaters you featured! I’m looking for a new warm winter jacket! Thanks for the shopping tips and great giveaway! I LOVE how nicely you put together all the outfits so very hard to choose top picks. I’d have to say the bow necklace and Loft poncho, as well as the riding boots, and the scalloped cami are my top picks. I love the green poncho and Pom Pom hat! Love your Ann Taylor boots! Top on my shopping list. Thanks for the giveaway! Love your boots! I’m wanting to buy new boots for the season. Loving the striped long sleeve top and striped, ruffled sleeve sweater. I’d love some new boots! Love the tulle skirt! Cute outfits! Oops, I meant dress. Thank you for making the list. 🙂 I am eyeing the J Crew lodge coat in heather cotton candy. Ohhh I’m so going to buy that poncho right now!!! Love the ponchos from Macy’s so will be ordering those. I love the twofer dress! With all of these great ideas, it’s hard to remember to buy for everyone else! I’d love the pom pom hat. I’m a big fan of the Maison Jules line at Macy’s and love the striped top with the pants! What brand are those pj pants? So cute! Love the boots – amazing code list! I’m going to give the Twofer dress a whirl! I’d get the boots and the poncho!! They have lots of nice watches there. I would buy a watch! I just purchased a bunch of essentials at GAP that I’ve been waiting to go on sale– thanks for the Black Friday list! Also, in the future, can you show the side view of your boots? They look really cute from the front, but i can never tell how wide the calf is as a reference…we have similar body types. Omg so kind of you to be giving back in this time of giving. I would love to win to give it to my mom to say thanks for everything. Even if I don’t win it’s still nice of you to do this. Love the outfits so cute. Loving the ponchos for sure on my list. Love the wrap dress and plaid shirt! I love your style! Just can’t afford right now. Especially, having a 10 month old baby but hopefully in the future I will. While I love the boots, I’d most definitely get the sweaters and hats. Thank you for always sharing so many amazing pieces and deals with us!! I would definitely get a pair of riding boots and I’d see what I could get at Nordstrom for my hubby! This holiday weekend I’m looking for a cognac leather jacket, a new vacuum (ha) and new carryon luggage. Ann Taylor button sleeve sweater and the Madison Jule sweater! So cute! I am planning on buying some sweaters. I went and got that plaid shirt! For $11, you can’t go wrong! I would love to purchase a pair of OTK boots!! I love your style! I love that flaunt where you want twofer dress. There is so much to get for my family with all these amazing sales! Everybody needs a little something this time of year. What a fantastic blog post that you put together for us and thank you for the opportunity to win! I’ll be keeping my fingers tightly crossed! I love the color and how you can pair it with so many outfits. Definitely would purchase the boots!! I absolutely love your style! I cannot get over the gray poncho and the Twofer dress 😍😍😍!!! SO IN LOVE WITH THE RIDING BOOTS. I had some about 2 years ago but they don’t fit anymore 🙁 Would also love a new beanie in white to match everything and go with winter snow! Thank you for your blog! Love following you on your blog and your Instagram. And I love seeing your matching mom-and-me outfits. Thanks for all the Black Friday sales tips!! I love the boots! I’ve never been able to find ones that don’t rub my knees and look silly on me. I love how you find pieces that look tailored for us shorties. The Twofer dress and envelope poncho are super cute! I need to buy black leggings. Cute plaid shirt. Haven’t been to JCP for ages. That first one piece dress is lovely! I would by the ruffle poncho, comfortable heels and a cute dress that could be dressed up or down. Oh, I love the Adalie boots and with the coupon code I think they are a must have. That pine green poncho is definitely on my shopping list! Love the hat and poncho combination! I like the Karen Scott poncho!! Love that dress from ModCloth! And the striped sweater with the bow sleeves. What a fun mix! Every single outfit is to die for! Ummm everything?! Lol But i def need riding boots and cardigans. It’s the items my wardrobe is missing. Thanks for all the work you do into putting these together! I want to get the riding boots, they are timeless. It’s lovelymommy from Instagram. I would love to enter your giveaway and buy a few more of the ponchos you have suggested. Some of the boots featured in this post are also on my wish list. Thanks for doing this giveaway for your followers! I love that green Loft poncho on you – I’m eyeing that for myself! I am planning on picking up a new blanket scarf and a trench coat. Annie! This is so sweet! I’ve loved following along with your outfits and Milan over the years! I think I would get the GMG Collection Paige Tweed Jacket and Paige Tweed A-Line Skirt– such a cute professional combo and so feminine! Love the riding boots! And the cozy sweaters too! Love your style! Very classy! Thank you for inspiring us.